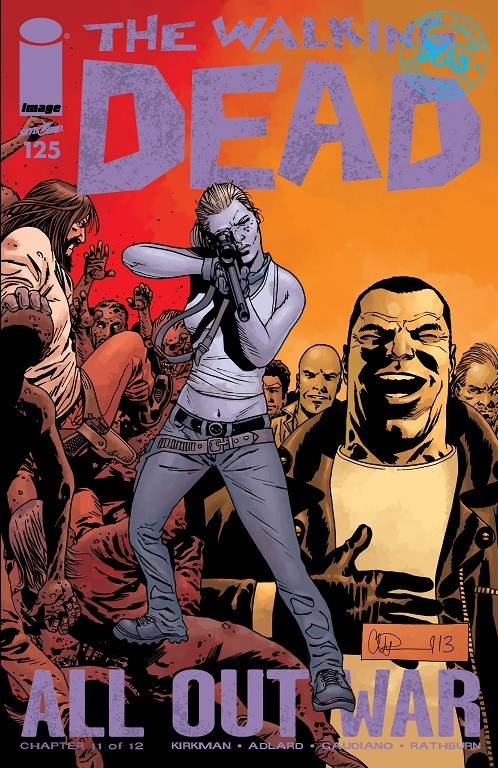 A Look at The Walking Dead #125: “All Out War,” Part 11 of 12 | What Else is on Now? So we’re almost done with the “All Out War” storyline of The Walking Dead and we’ve got a supposed game-changer on our hands. I say supposed because we don’t know Negan’s ultimate fate, but we’ll get to that in a second. With Nicholas gone, that’s one less character from the Alexandria Safe Zone. And while it’s unfortunate to see him go, given the deep bond he had with Mikey and Paula, I am glad that he didn’t go out with any grudges toward Rick and the rest of the newcomers, as he did when first introduced. 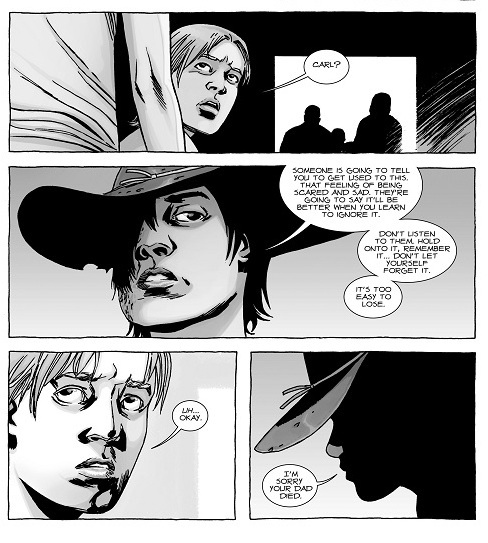 This death also allowed for a brief, but important character moment between Rick and Andrea, with Rick telling Andrea to remind herself that they don’t die. I like that even in the heat of the things, these people maintain their survivalist mentality. 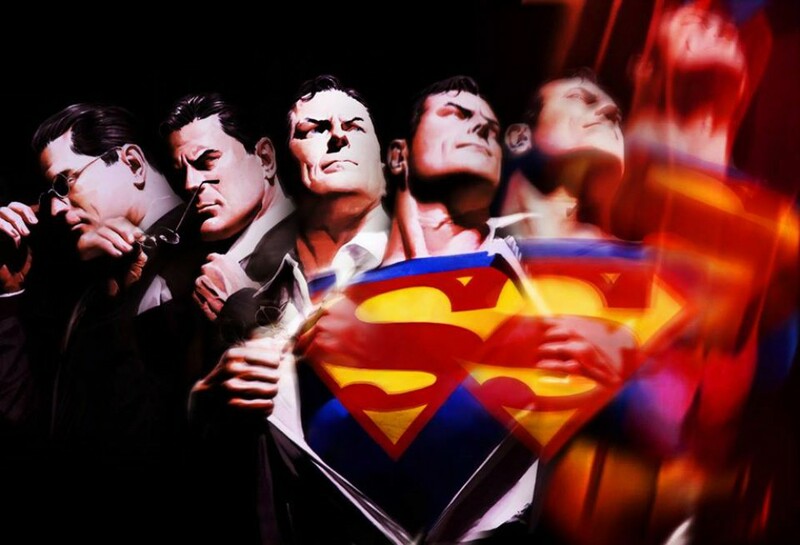 It’s what made them such a different, yet strong looking group of people compared to most of the people they’ve run into. Despite losing some of their own in gruesome ways, they move forward. Another small moment I liked was Carl’s brief talk with Mikey about not holding onto feelings of sadness or fear. Burying those emotions can just cause them to boil under the surface until they come out the wrong way at the wrong person. But holding onto those feelings keep these people human. It gives them something to feel instead of just walking through life and accepting that everyone around them is eventually going to die. As for Rick, I first want to talk about his injury. It seems like Dwight went against Negan’s order and shot Rick with a clean arrow instead of a contaminated one. That doesn’t explain his brief fever explosion last issue, but at the same time, that shot looked pretty painful. And yet Rick is walking around perfectly fine. The guy is already missing his right hand and he’s made due, but an arrow to the body, particularly where he took it- no one should be able to just shrug that off. The same can be said for Carl having some of his face blown off, yet he can still shoot well. He’s got a blind spot, yes, but he’s still ready for a fight. So was Rick’s injury really as big of a deal as everyone made it out to be, given how fast he seemed to recover? 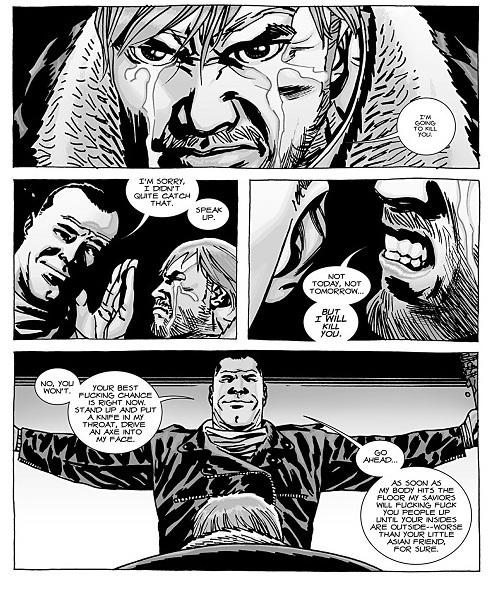 And then, of course, there’s Rick and Negan’s conversation toward the end of the issue. The look on Negan’s face was priceless, as if no one ever just came up and told him how much of a prick he’d been because of his system where he takes half of people’s items just so he won’t be forced to kill them. Well, maybe people did, but they probably got a hot iron to the face. 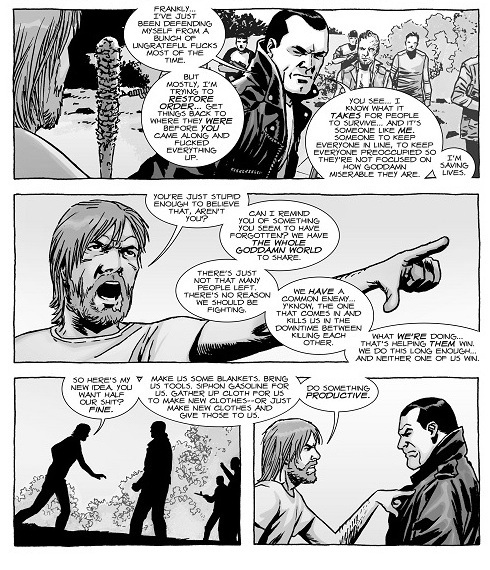 You get the sense that Negan truly realized the error of his ways and was very much open to a barter system. He talked of being a hungry dog and draining supplies from other groups to hoard it all for himself, but after Rick’s speech, maybe Negan could actually change. But then, this is The Walking Dead. 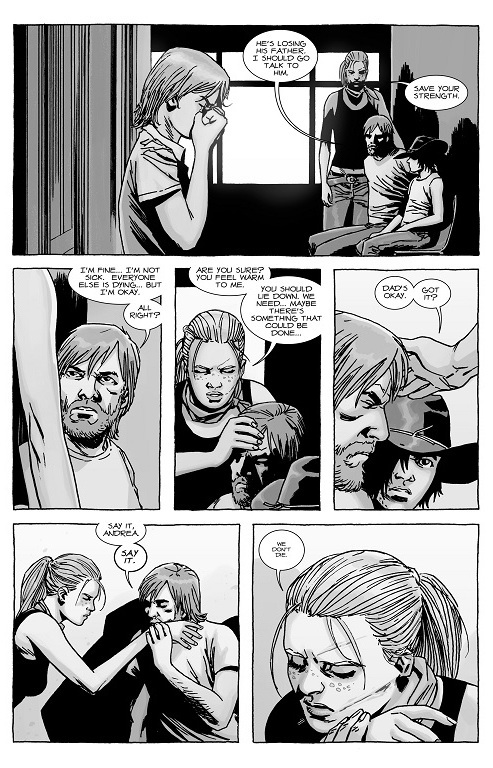 And Robert Kirkman, as always, throws in a curveball on the last panel to entice readers to anticipate the next issue. No idea what will happen to Negan and the saviors after Rick’s surprise attack. Dwight may side with the Alexandria group, given how much he hates Negan, but maybe he just wanted Negan’s position of power for himself. We’ll see. And how ironic is it that the very action Negan dared Rick to do to him back in issue #100 has now come to pass? This entry was posted in The Walking Dead and tagged Andrea, Carl Grimes, Dr. Eugene Porter, Dwight, Jesus, Maggie Greene, Michonne, Negan, Rick Grimes, roamers, Rosita, The Hilltop, The Sanctuary, The Saviors, The Walking Dead by omarid513. Bookmark the permalink.